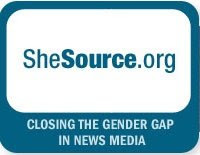 Despite their growing ranks as experts in fields ranging from national security and military spending to technology and health care, women continue to be drastically underrepresented in the news media as policy shapers and leading voices of authority on critical issues. We've heard from journalists that say the main reason they do not quote women as experts on a range of topics is simply because they do not know how to find them. Jane Rigby is a Spitzer Space Telescope postdoctoral fellow at the Carnegie Institution. She has a particular interest in demystifying science for the public, and to that end co-founded the first Penn State Astrofest, served on the editorial board of Odyssey, a science magazine for children. Lisa Haverty applies her Ph.D. in cognitive science to the tricks of advertising. She works for Arnold Worldwide as their "brain whiz", providing "expertise in how people think and learn provides new and unique insights into how people perceive and remember – or don’t remember - ads." Judith Hand is an evolutionary biologist, author, and futurist who has created A Future Without War, a series of essays on strategies for ending war. Sonja Ebron has a Ph.D. in electrical engineering, with special expertise in power systems and utilities. She has been an Assistant Professor of Electrical Engineering at Hampton University. She is currently the CEO of blackEnergy, an organizer of energy bying groups that help people use their utility bills to support Black communities. Climate scientist Brenda Ekwurzel is a former faculty member in the University of Arizona departments of Hydrology & Water Resources and Geosciences. Currently she leads the Union of Concerned Scientists' climate science education work "aimed at strengthening support for strong federal climate legislation and sound U.S. climate policies." Mathematician Cindy Williams is a Principal Research Scientist at the Massachusetts Institute of Technology's Security Studies Program where she "focuses on U.S. budgets for national security and the policies that surround military personnel in the United States and Europe." Prior to joining M.I.T. she was an Assistant Director of the Congressional Budget Office. If you would like to recommend someone as an expert (including yourself) you should contact SheSource.org. Thanks for mentioning me and blackEnergy in your list of PhD scientists listed on SheSource.org. I don't get to tinker in the lab as much in my current incarnation, and I sure miss it, but it's nice to be recognized. Your readers might be interested in our blog about African Americans and energy. Keep up the good work and good news about women in science and engineering. Wow..Good work on your blog as always. I am gonna go ahead and go list myself out there as an expert. Sonja: Thanks for the link. LCB: Good for you, go for it!